Alexis Rodriguez joined the ranks of women entering male-dominated industries when she enrolled in Palm Beach State College’s Heating, Ventilation, Air-Conditioning and Refrigeration program last fall. Now, after receiving the Hilmor Retool Your Future Scholarship, nothing can stop her. Hilmor, a leading manufacturer of HVAC/R tools, started its scholarship contest in 2014 to help the next generation of HVAC/R technicians. Rodriguez, one of six 2018 winners nationwide and the only female, received a $5,000 scholarship, which covers nearly all the costs of the HVAC/R program as an in-state student. 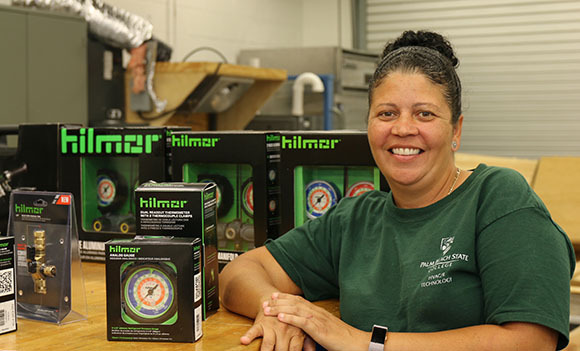 She also received a Hilmor tools starter kit valued at about $1,000 and an all-expense-paid trip to Chicago for the 2018 AHR Expo, the world’s largest HVAC/R industry trade show. In addition, the PBSC program received a complete set of Hilmor tools. “It’s been a wonderful experience, and I thank Hilmor for that and Mikayel,” said Rodriguez, who credits Mikayel Ishmael, PBSC student development advisor II, for telling her about the scholarship and encouraging her to apply. Rodriguez now sees a world of possibilities ahead. Yet before discovering HVAC/R, career satisfaction eluded her. Then, upon reading about the HVAC/R program on the College’s website, something clicked. Pete Goodman, an HVAC/R instructor at PBSC for 10 years, notes that this is the first time he’s had a woman enroll in his class, and he’s glad she did. According to the latest data from the U.S. Bureau of Labor Statistics, only 2 percent of HVAC/R mechanics and installers are women. However, this still represents an increase over prior years, and organizations like Women in HVACR are supporting women’s success in the industry. According to the BLS website, mechanics and installers earned an average annual salary of $47,080 in 2017, and the profession is expected to grow 15 percent through 2026, much faster than the 7 percent average. Learn more about PBSC’s HVAC/R program and explore other nontraditional career options. 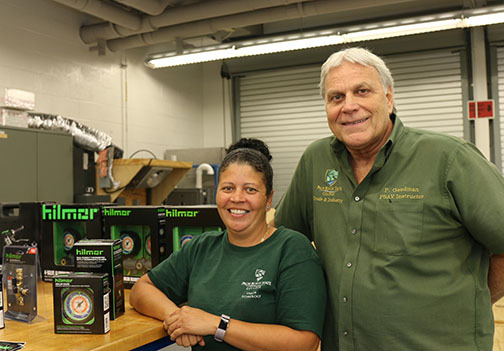 Pete Goodman’s HVAC/R students pose with the Hilmor products presented to PBSC. I am so, so proud of my niece, Alexis, for her accomplishments and appreciate and thank Hilmor for helping her with this scholarship. Way to go, Alexis !! The sky’s the limit !! This is so cool! Get it? Kudos to you Alex! Congratulations on breaking through! I wish you much success in your pursuits. I am so proud of you Alexis!!! God bless you. Te sky is the limit.